DesignCrowd offers a wide range of products and services at incredibly low prices in Australia. These DesignCrowd promo codes expire soon, so don’t forget to bookmark this page now. Seasonal DesignCrowd deal & sale: Grab custom graphic design today at DesignCrowd and get a discount of 25%. DesignCrowd free delivery offer: Post job at DesignCrowd as per your requirement and get a huge discount of 25% on your next design. Limited time DesignCrowd coupon: Get a discount of $20 on your dream design project at DesignCrowd. Check out now! Latest DesignCrowd promo code: Use coupon code at DesignCrowd and save $20 on stunning graphic design now. New DesignCrowd discount: DesignCrowd is delighted to offer a cool discount of $10 on your next design project. Hurry up! DesignCrowd was established in 2008 and is a digital marketplace that provides the website, logo, graphic and print design services by providing freelance design and graphic designers access to studios around the globe. DesignCrowd, gives access to a ‘virtual’ repository of more than 537,000 designers around the world through crowdsourcing. This helps you access the best international talent at the lowest possible prices. When you post a project on the retailer site’s platform, you can expect to get a minimum of 50 designs. DesignCrowd prides itself on quality and quantity. They use Crowdsourcing 2.0 to achieve a higher quality, fairer and sustainable crowdsourcing so that every designer is paid and customers can easily browse and select the best designers. They are registered as DesignCrowd Pty. Ltd.
Companies and designers in the following countries are eligible to use DesignCrowd’s services: Australia, India, USA, Canada, Romania, Israel and more. Corporate Identity: Logo, stationery, & letterhead design, envelope design, name card, PowerPoint and business card design. Web Design: Web page, Facebook, WordPress, banner, and blog design, etc. Graphic Design: T-shirt, App, Vector, Book Cover, label, CD cover, Art, etc. Print Design: Flyer, Poster, Invitation, Newsletter, Advertisement, Calendar, catalog, Sticker, Newspaper Ad, Menu, Greeting Card, etc. Designers: You can find designers of all types. Some of the types of designers to choose from are graphic, logo, web, business card, T-shirt, Wordpress, brochure, poster, illustration, packaging, etc. Browse Jobs: The Freelance designers who are looking for work should check this section. Customization: Designers who are looking for work may customize their profile to increase their chances of being selected by a business or company. Browse jobs according to project specifications. Find a specific type of designer. 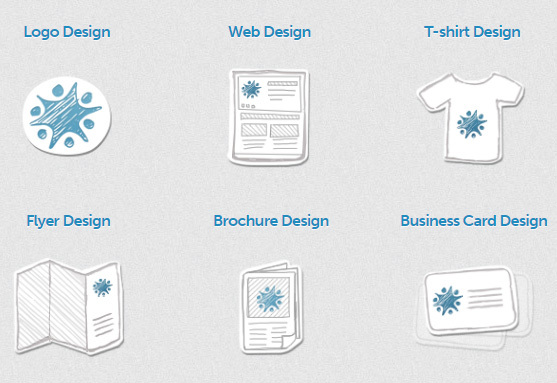 Choose the design service according to category. You may also sign up for a account and search for freelance work by selecting “I’m a designer”. Post a brief: Describe your project and translate your vision into guidelines for the designers. Get 100+ designs: You can browse the many designs, the company will send new designs to your inbox. Feedback and revise: Easily share with friends to know their feedback and message the artists for edits. Your online business needs an eye-catching logo and fascinating design; why not have experts do it for you. Hire a team of professionally qualified specialists for designing a logo, website, print, graphic and much for your brand. Make sure you used some up-to-date coupons from our Services categories that will save you a great deal on this. Graphic design discount – 25% off. Save $20 on your design project. Get Your Dream Design Today and Save $10. Subscribe to the newsletter and receive exclusive offers, design inspiration and business tips right in your inbox. For signing up you can scroll down the page to the right side. Enter your email address in the field marked “Join”. You can manage and schedule your social media accounts plus get online dashboard access with collaboration, security, and integration available at HootSuite. Choose the type of design on DesignCrowd. Enter the discount or coupon code. Pay the discounted price and launch your project. Join the DesignCrowd YouTube channel and you will get to know how to use the website and how to crowdsource your perfect design assets through DesignCrowd. This is a promo video about how to Score a successful logo design. To learn and participate in various types of contests such as illustration, web and graphic design, photography etc. you submit your best ideas and the community will vote on the submission. Winners earn points on the leaderboard. Community contest is a way for designers to interact with each other, develop the new skills, showcase their talent, mentor others or to just have fun. Your can participate for free in all Community Contests for Community Points or for real prizes. Completed projects are subject to the deadlines set out between you the company/business and the freelance designer. If you do not like any design, you can request a refund within 30 days of posting the project. Posting fees and upgrade fees will not be refunded. If you did not receive your design, you will receive a refund on the project and the posting fees paid to the company. Submitting designs and more info.